I have always been fascinated with butterflies. They are simply beautiful. It is disappointing that I haven't done a lot of butterfly inspired nail designs. I have one to share with you today and hopefully I'll be able to share more. If you browse my nail art designs, you'll probably notice my preference for creating designs on or near the free edge. I personally have short nail beds and nail art on tips gives an illusion of longer nails. 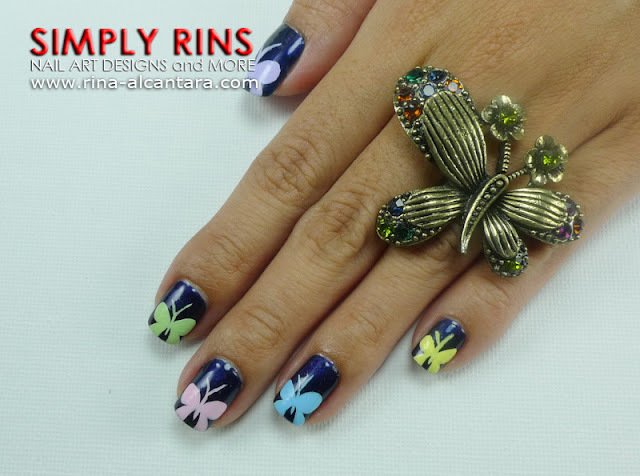 This colorful butterfly nail art is no exception. I hand painted the butterflies on the tip of my nails for this design. I used 2 coats of OPI Russian Navy as background color. Bottle color looks like a dark purple but finishes as midnight blue in actuality. I used acrylic paints for painting the butterflies. Since I decided on a dark base color, I thought pastel colors for the butterflies would make them stand out. I also chose to just paint a silhouette instead of adding details to the butterfly. I know, I was a little lazy. But honestly, I figured a silhouette would look classy. I used the same color pattern for the butterflies on both hands. If you would like to try this nail design, you may want to attempt to use different colors for every nail. So cute! I really like the butterfly silhouette, it's very stylish. ohh this is pretty!! in fact the silhouette makes it looks pretty and I loved the pastels too! so pretty love the contrast of the colours against the navy! san ka nakakabili ng acrylic paint for nails? pwede din ba gamitin yung ordinary na acrylic paint sa nails? you're right, your nails do look longer when you paint near the free edge. I wonder if I can pull off the same illusion with my tiny nails! Anyway, i love the color combination and how girly this nail design. :) great job rina!